How to create product discounts. A product discount applies to a specific product or subset of products based criteria you provide. Specific products or SKUs: for example, a sale on a specific color of handbag. Subsets of customers: for example, a “platinum members” only sale. Subsets of products: for example, a sale for all handbags or wallets. Business-defined product attributes: for example, a sale on products by a certain designer. 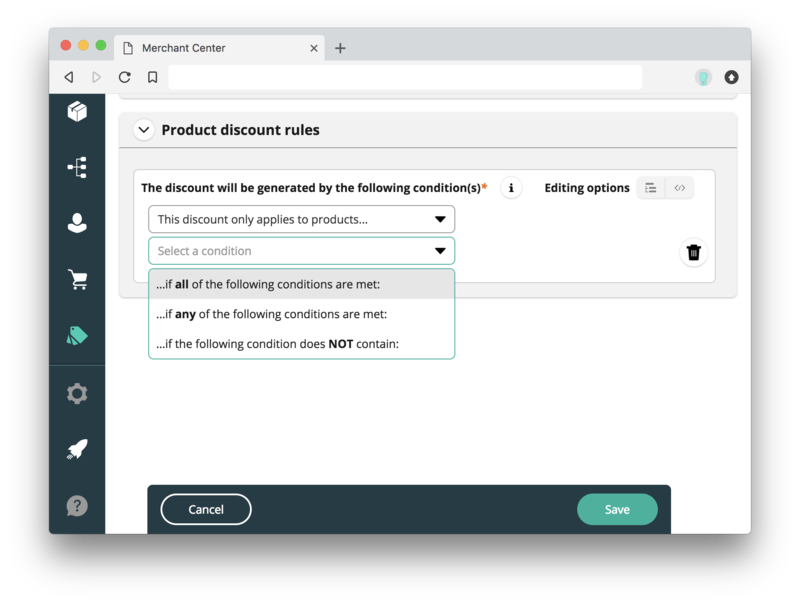 Product discounts apply before adding a product to the cart, and are stored as a discounted price in a Product Variant’s product information. This makes them useful for displaying discounted prices on a product information page, for example. Note: Product discounts can take up to 15 minutes to fully apply. For more information, see Eventual Consistency. In the Merchant Center’s main menu, navigate to Discounts > Add discount. Click Add product discount. Product discount name (Required): the display name for the product discount. Product discount description: a plain-text description of the discount. Discount value (Required): the discount type (Relative or Absolute) and the amount. Rank (sortOrder) (Required): the relative importance of the discount as a decimal value from 0 to 1. A larger value ranks higher. Note: Product Discounts do not stack. Only the highest ranked Product Discount applies. Valid from: the date from which the discount is valid to apply to a product. Valid until: the date from which the discount is invalid to apply to a product. This discount applies to all products without restriction: applies the product discount to all products in your store. This discount only applies to products…: applies the product discount to products which satisfy the product discount rule. For more information, see Configuring product discount rules. Discounts are always created in the deactivated state. To apply a discount, you must activate it first. 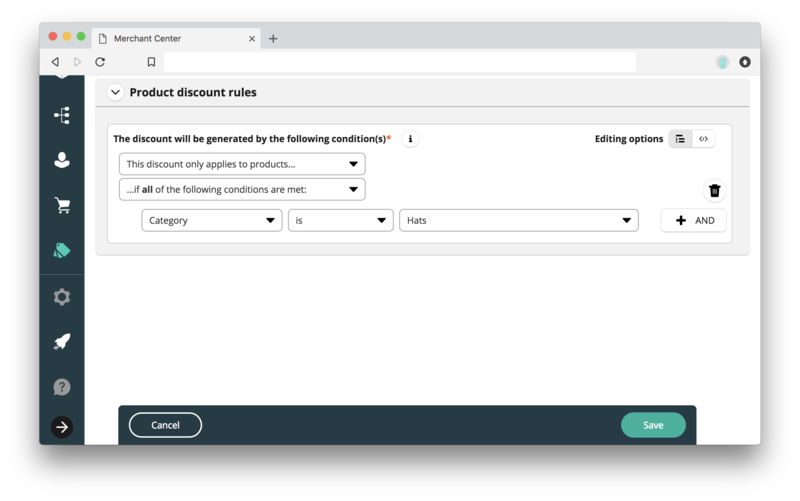 If you select This discount only applies to products… in the product discount rule builder, you have the option to create a rule which applies a product discount to a subset of products. Define one or more rules. … if all of the following conditions are met: All rules defined must be true in order for the discount to apply. Shows AND buttons when creating additional rules. … if any of the following conditions are met: Any rule defined must be true in order for the discount to apply. Shows OR buttons when creating additional rules. … if the following condition does NOT contain: The rule defined must be false in order for the discount to apply. You cannot define multiple rules with this operator type. A predicate, which identifies data in the commercetools platform associated with a product. An operator, which checks the state of the data. Value(s), which you input to check the predicate data against. In this example, Category is the predicate, is is the operator, and Hats is the value. The operators available depend on the type of data the predicate stores. For example, the Price predicate allows for greater-than or less-than comparisons, because price represents a number in a particular currency. The Product key predicate, however, does not, because Product keys are text strings. Select a predicate from the first drop-down menu. Note: By default, the drop-down menu does not show all predicates. Select Show more… in the drop-down menu to see which predicates are available. Select an operator from the next drop-down menu. Provide or select a value to compare to in the next field. Note: The value field’s input type changes based on the predicate and operator, and in some cases is not present at all. (Optionally) define subgroups for a rule or additional rules using the AND or OR buttons if available. a. Select Add subgroup for this rule and fill in the input fields as required to create a sub-group (nested) rule. b. Select Add new rule and fill in the input fields as required to create a non-nested additional rule. Navigate to the discount you want to activate. In the upper right hand corner, click the Status slider. In the popup which appears, click Activate discount. 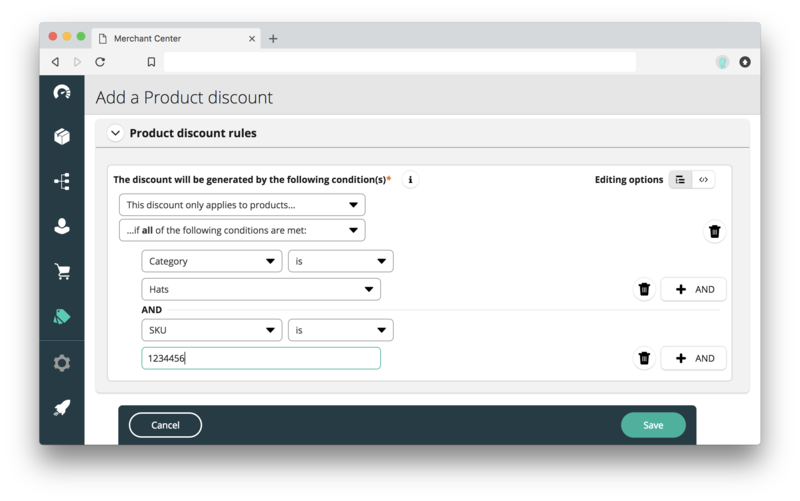 You can duplicate an existing product discount if needed. 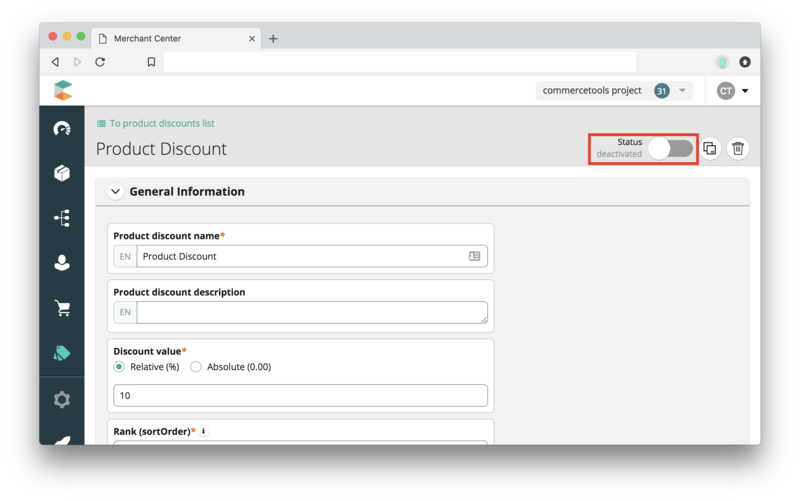 This saves time when setting up product discounts. Navigate to the discount you want to duplicate. In the upper right hand corner, click the Duplicate button.